Issue #252 • April 18, 2019•Buy Now! Caroline Campbell was the kind of woman who, upon discovering she’d put her underwear on backwards after dressing in the dark, would remove shoes, hose, Spanx and turn that underwear right-side out even if she was in a public bathroom. Caroline’s favorite color was gray, not steel or a gray closer to blue. The gray she most often wore was the color of dishwater, and her outfits were all variations on a simple jacket, white blouse and a pencil skirt. Caroline wore black pumps with two-inch heels, and her brown bob was never allowed to be longer than her collar. On Friday, at precisely 5:15 p.m., Caroline stepped out the door of the Greco Savings and Loan where she was the general manager, a job she liked because of its need for precision. The bank opened at 8:30 a.m. and closed at 3 p.m. From 3 p.m. to 5 p.m. Caroline and her four tellers tallied the daily transactions, put the cash (face-up, ordered by serial number and amount) in the proper drawers in the safe, emailed the home office with the numbers, set the alarm, shut the door, and pulled down the gate. Though she lived three blocks east of the bank, every Friday afternoon Caroline walked four blocks west to the Wash & Fold, where she picked up her laundered blouses from the week before. Katherine Hubbard lives just outside Philadelphia with her family. She is a lecturer at Jefferson University where she teaches academic writing to first-year students and creative writing to medical students attending the Sidney Kimmel Medical College. Her stories have appeared in Glimmer Train, Blackbird, Front Porch Journal, Penman Review and elsewhere. You can read more of her work, as well as find a pretty good recipe for bread, at thisthingneedsatitle.com. KH: This story was inspired by a prompt I usually give my students early on in the semester, and I actually wrote the first few paragraphs while my students were writing their own in-class drafts. I don’t usually write when my students are writing, but the first line of the story popped into my head and I had to get it down. The prompt is this: I ask students to make a list of all the short story “rules” they can think of. We put those rules up on the board and I ask them to pick one to follow and one to deliberately break. One of the “rules” was that there should never be more than one point of view or perspective in a short story. I wrote that first paragraph about Caroline, then began the second with, “Nick Stevens was the kind of man who...” Later, when I started really working on it, I found myself wandering in and out of the different consciousnesses of the characters—which I just loved doing, breaking that “rule” about point of view. However, much later, as I was revising it, I realized I hadn’t actually broken that rule at all because the main voice and point of view was the omniscient narrator’s. PR: Speaking of which, I’m kind of in love with the narrator of this story. It seems to hover just over the shoulder of anyone it wants to. But what I love most about the narrator is that it simultaneously observes the characters and talks intimately to the reader. Is this a narrative voice you’ve used before? KH: I’m so glad you love this narrator! I loved writing it—it was so much fun to weave around in this story, coming in close to the characters then pulling back to encompass the peripheral people and the city around them. The most satisfying thing about that voice was writing those long meandering sentences. When I was revising, at some point, I don’t really remember when exactly, I realized I was using a storyteller’s voice—like you find in fairy tales. It’s the person telling the tale to a group of people, in a way. I verbally tell stories all the time and have since I was a kid—always embellishing them for dramatic effect—so in a way, yes, I’ve used this narrative voice before. When we were first married, I had to ask my husband to stop interrupting me while I was recounting some funny event or experience because he was always turning to me and saying, “That’s not what happened!” True—but hush, sir, because I was making it better! I think I’ve been using this voice all my life, it’s just that, for this story, that narrator showed up on the page. 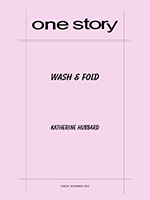 KH: This story flowed from the moment Caroline walks into the Wash & Fold until she goes home with Nick. But after that, I wasn’t sure where it was going to go. In an earlier draft, I had them going back to the hospital to see Mr. and Mrs. Greene, who thanked them warmly for their heroics—ugh. Gave that to my writing group and they did not like it either. So I let the story sit for a few months because it was frustrating me. Then I realized that there was no way poor Mrs. Greene could survive choking like that, and once that became part of the story, the rest of it fell into place. I think in the first draft the narrative voice ran out of steam, and I had to take a break from it in order to hear it again. PR: The notion of identity is woven throughout. The narrator seems fascinated with how the characters define themselves, and, in some cases, how what happens to them in the story changes that definition. Was that always the plan, or was it a groove you slipped into after you worked out the language of the first paragraph? KH: In the early drafts it was absolutely more of a groove than a plan. But in revision, I leaned into that notion of identity because I’ve always been interested in the gap between the ways in which we envision ourselves and the ways in which others actually see us. PR: How long did it take you to complete this story? KH: I think it probably took a year from the first draft to the final version, counting the months I set it down for a bit. KH: I am in the process of organizing my stories into a cohesive collection. I am also working on a different collection of stories that are linked in a novel-ish way—and it may be that by the time I’ve finished it, the stories will have merged into an actual novel. I’m not teaching at all this summer and my goal is to have a full draft together by August, but we shall see. Of course, because it is currently the last weeks of the semester, the most pressing thing I’m working on is grading student papers. KH: To avoid revising inside a document directly on the laptop. I print every draft, mark it up, then retype it from scratch, creating a new document. This came from E.L. Doctorow, who was my workshop advisor when I was in grad school years ago. He felt that the stories he read pre-computers were tighter because if you made a mistake or wanted to change something, you had to at least retype that page, if not the whole thing from the beginning. In this way, you quickly figure out what is good and what is dross. I do this all the time, and when I’m really stuck, I put the draft away entirely and rewrite the whole thing from memory. I am always happier with that new draft.